REAL . The shocking and untold 'breaking news' story told below is another powerful warning about the closet Democrats that RINO's have been sneaking into the Republican Party of Hawaii for years in order to 'keep the peace' with the Democrat Party (i.e. to keep R's weak and D's strong). With this newest story of card-carrying Democrats (who currently hold leadership positions in the Democrat Party) actually involved in running our island GOP establishment, is it really any wonder that our RINO-controlled Hawaii's Republican Party REFUSES to go on the offensive against Democrats and REFUSES to take on failed 'progressive' policies in state, county, or federal government? Today's installment of HIRA's "Infiltration Alert" features two more activist Democrats working actively to control our party and its campaigns. If you wonder why our party keeps losing, moving to the left, and even remaining on the sidelines, then take some time right now to get to know a couple of liberal Democrat women who have been part of the Djou campaign leadership, the Hawaii GOP leadership, GOP "training" and "consulting" for Hawaii Republican candidates, and the Democrat Party's official leadership team. Their names: Kainoa Kaumeheiwa-Rego and Tania Kehau Cortez-Camero. Many readers of this newsletter already know Ms. Kaumeheiwa-Rego and Ms. Cortez-Camero because they've interacted with one or both of them over the years while dealing with either the Djou campaign or the Hawaii GOP or the House Republican Caucus or GOP 'fundraising' and 'candidate training' in recent years. You should NOT expect to hear from either Charles Djou or Beth Fukumoto or the GOP any confirmation that they've allowed Democrats to help run the party or the Djou effort. And you certainly won't hear admissions from party leaders anywhere across the state that they were duped by these infiltrators. What's worse, we know there are MORE infiltrators in party posts right now; at GOP party headquarters, at Republican offices at the State Capitol, and on Republican campaigns statewide. 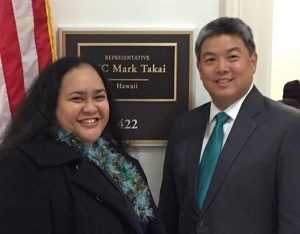 Now, if you need more help recognizing these two, it might help to look at this photo of the RINO faction known as "Our Party, Our Ohana" which began taking over the Hawaii GOP in recent years. Circled in yellow are the two fake Republicans in question along with Democrat consultant Dylan Nonaka, HART rail employee Chris Wong, and other familiar-looking phony Republicans whose #1 priority was to neuter our party and take it in an even more liberal direction by eliminating all of the conservative Republican positions on issues taken by the Hawaii GOP's Platform; adopting a blank sheet of paper instead -- a joke platform called "LLIFE" which has remained our state party's silent and neutral platform to this very day. But the story gets even worse and corrupts or taints even more Republicans when you read the background and the dozens of shocking details that follow. In HIRA's last installment of "Infiltration Alert" several weeks ago , we revealed how RINO state party chair Fritz Rohlfing installed a Democrat Party operative named Radiant Cordero at GOP headquarters . . . until HIRA's exposé resulted in her ouster from the Honolulu county GOP position she occupied . . . the exact same left-leaning Honolulu county GOP which tried to have the Republican Party formally endorse a Democrat for re-election along with some RINO's just this past weekend. 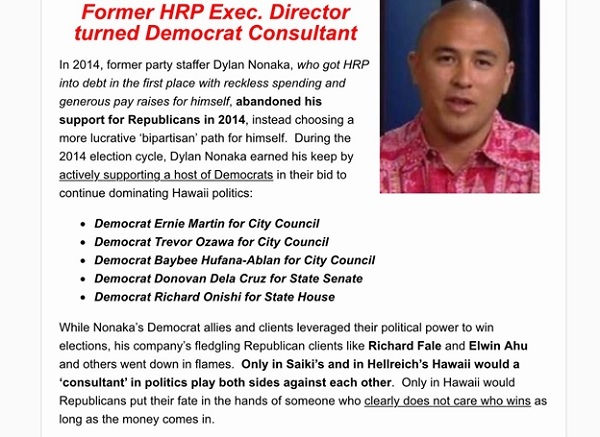 Prior to exposing Cordero, HIRA told you about Democrat political consultant and Miriam Hellreich associate Dylan Nonaka who orchestrated the above-referenced party takeover in 2009 with other closet Democrats and RINO's under the banner of "Our Party Our Ohana", mismanaged RINO Charles Djou's campaign, then gave himself a high-paying job at GOP party HQ, demanded a big pay raise, ran up a huge financial debt for the party, got 'fired', and then went back to helping Democrat candidates while continuing to pass himself off as a Republican spokesman on TV and radio shows and in interviews with publications. Here's a flashback. Cutting right to today's revelations, these two Democrats Kaumeheiwa-Rego and Cortez-Camero from "Our Party, Our Ohana" are extremely representative of the kind of fake Republicans who are in charge of Hawaii's Republican Party; the kind of phony Republicans who cause the Hawaii GOP to make bad decisions, adopt bad strategies, waste LOTS of money, and continue losing to the Democrats year after year after decade after decade. 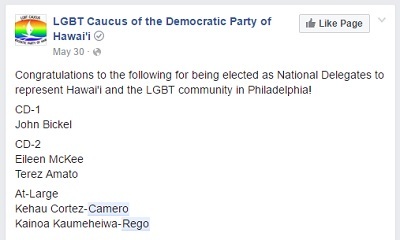 First, before we get to know Charles Djou's and Dylan Nonaka's buddies Kainoa Kaumeheiwa-Rego and Tania Kehau Cortez-Camero a little better, let's all join together with the LGBT Caucus of the Democratic Party of Hawaii in congratulating those two for becoming National At-Large Delegates to the upcoming Democratic convention in Philadelphia. We're sure that the entire leadership of the Republican Party of Hawaii is very proud of you. Ladies, please hurry back so you can help Charles Djou, Fritz Rohlfing, Beth Fukumoto, Pat Saiki and Miriam Hellreich do more damage to the Hawaii GOP. 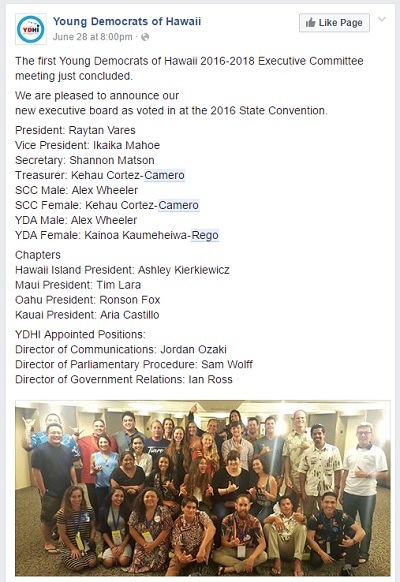 You know, we should also belatedly congratulate Kaumeheiwa-Rego and Cortez-Camero for becoming officers of the Young Democrats of Hawaii's Executive Committee back in 2014. Seriously, when you consider how much bigger the Democrats are versus the tiny empty shell of a Republican organization controlled by Miriam Hellreich, those two infiltrators took on a really big responsibility. 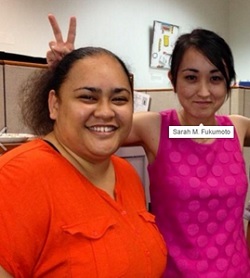 You see, while the Hawaii GOP merely spends its time choreographing dozens of fake Republicans to show up at tiny, infrequent meetings at GOP headquarters to endorse Democrats and RINO's, these two women have been busy year-round since 2014 coordinating thousands of Democrats to make phone calls, signwave, knock on doors, prepare mailers and actually win elections . . . all while pretending to be Republican leaders and party officers. 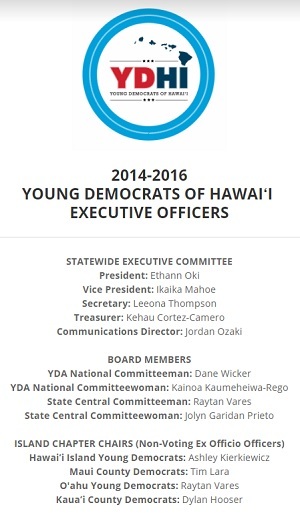 Here's how their group describes itself: "The Young Democrats of Hawaiʻi (YDHI) is the State of Hawaiʻi's largest youth-led democratic progressive political organization, and has served as the official youth arm of the Democratic Party of Hawaiʻi for than 60 years. Made up of 4 chartered County chapters with hundreds of members within the Democratic Party of Hawaiʻi. Young people are now a major force in Hawaiʻi politics. Our past membership includes United States Senators, Congressionals, Governors, and County Council members. The current membership includes campaign managers, fundraising consultants, field experts, advocates, elected officials, State Democratic Party officers, and activists with extensive experience in local, state, and national elections." OMG, that one subsection (Young Democrats) of the huge Democrat Party is WAY more organized than either the State GOP or any of its beleaguered County GOP organizations. They actually do stuff needed to win elections, not like Miriam Hellreich's persistent do-nothingness with occasional shameless bursts of selfish action just to retain control of the Hawaii GOP. With that bit of background, let's take a close look at the kind of people who have been running the Charles Djou campaign and the Republican Party of Hawaii and working in Republican offices at the State Legislature and GOP campaigns . . . all while being active Democrats determined to destroy the Hawaii GOP . First, let's pay tribute to progressive Democrat and sovereignty activist Kainoa Kaumeheiwa-Rego's lengthy campaign on behalf of herself and Hillary Clinton. 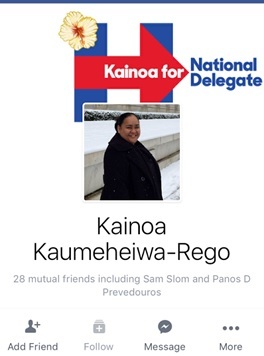 Having attended the Democrat State Convention ( delegate #110 ) and then winning a seat on the national delegation to support Clinton at the Democrat Convention in a few weeks, Kaumeheiwa-Rego now needs your help in raising the funds to help her travel to Philadelphia. Surprisingly, neither Pat Saiki nor Miriam Hellreich nor Lynn Finnegan nor the RINO's in the 'Our Party, Our Ohana' gang have given any money to Kaumeheiwa-Rego's GoFundMe campaign . You'd think they would, since Kaumeheiwa-Rego has been doing their bidding in the party for years. But take a look at some of the Democrat VIP's who are donating : Heather Giugni, former Democrat state rep and daughter of Inouye's late sergeant-at-arms; Mahealani Cypher, formerly known as Denise De Costa, the Democrat City Clerk who nearly prevented Stop Rail Now's voter initiative from going on the ballot; and Hermina Morita, who recently resigned as chairwoman of the powerful State Public Utilities Commission after serving for a decade and a half in the state house (Democrat, of course). Gosh, Kaumeheiwa-Rego sure made a lot of Democrat buddies while 'working as a Republican' and 'leading' the Hawaii GOP. 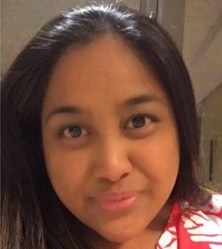 It's a fact, party State Committee member Kaumeheiwa-Rego was simultaneously working for Democrats and Republicans right under the noses of RINO party "leaders" and elected RINO Republicans who haven't minded her infiltration of the Hawaii GOP at all. 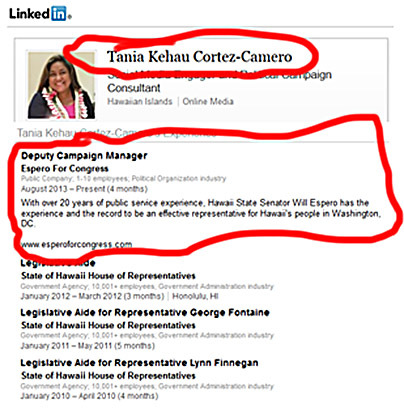 In reviewing Kaumeheiwa-Rego's LinkedIn page , she was hired to be RINO Aaron "Ling" Johanson and RINO Beth Fukumoto's Legislative Analyst at the State Capitol along with Fukumoto's left-leaning sister Sarah Fukumoto. Also not surprising, in addition to being regularly utilized by Hellreich and other RINO party leaders for Kaumeheiwa-Rego's vote on the Hawaii GOP's State Committee -- as a 'stealthy' Oahu-residing district chair that the party pretended was the top Republican leader in Hilo in order to control the outcome of controversial State Committee votes -- this same Democrat infiltrator and Nonaka-affiliated fundraising consultant also worked as RINO former governor Linda Lingle's Policy Analyst. Again, not surprising! 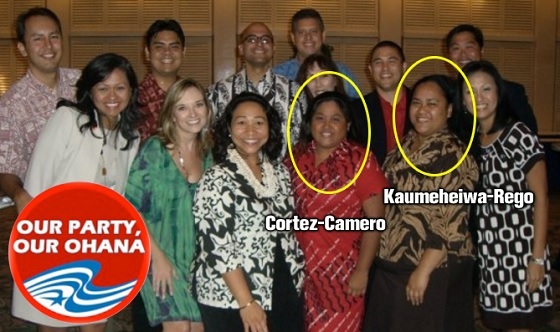 With her business partner and fellow Democrat infiltrator friend, Ms. Cortez-Camero, Kaumeheiwa-Rego's company Haina Consulting 'consults' for the Charles Djou campaign , charging thousands of dollars for admin services while clearly helping to keep Djou's RINO positions close to those of Democrats ; such as supporting amnesty for illegal aliens, creating HART, supporting the Akaka Bill, supporting Common Core and the radical LGBT agenda, etc. For years, using Haina Consulting , these two infiltrators have taken 'consulting' money from GOP candidates and led them to universal defeat in each election -- folks like Christopher Baron, Sam Aiona for City Council, Tracy Bean for State Senate, Virginia Enos for State Senate, Colleen Meyer for State Senate, Richard Fale for State Senate, Panos Prevedouros for Mayor, Bob McDermott for City Council, and Charles Djou for Congress. 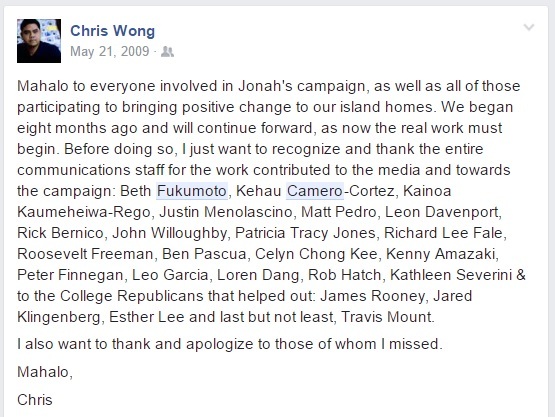 Then, around the time Djou won that 3-way special election against Hanabusa and Case (which made Djou a congressman for about a month or two), Kaumeheiwa-Rego also worked as a fundraiser for 'Our Party, Our Ohana' leader Lynn Finnegan; providing $1,000 in fundraising consulting services for that ill-fated campaign for lieutenant governor. 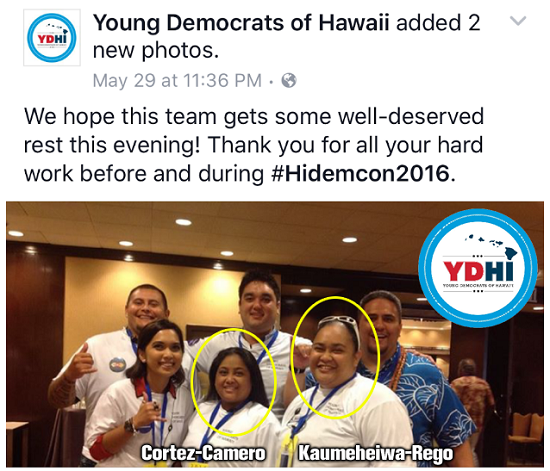 Kaumeheiwa-Rego and Cortez-Camero rebranded themselves a couple of years ago as Millennial Consulting , which does work for the Democrat Party and labor unions ; most notably the Hawaii Building & Construction Trades Council, AFL-CIO which really likes to beat Republicans in local and national elections. Please note that their new lobbying business started in March 2014 while both were actively involved in Republican leadership positions. 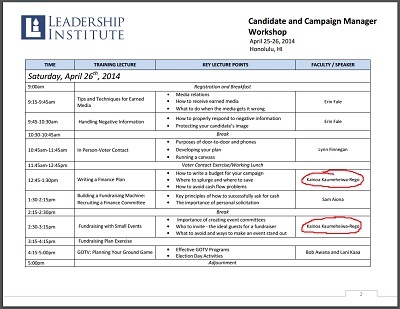 In fact, while pushing the Democrat agenda at Millennial, Kaumeheiwa-Rego was simultaneously partnering in April 2014 with RINO's at Hawaii GOP headquarters to offer extremely flawed training to Republican candidates. That's right. 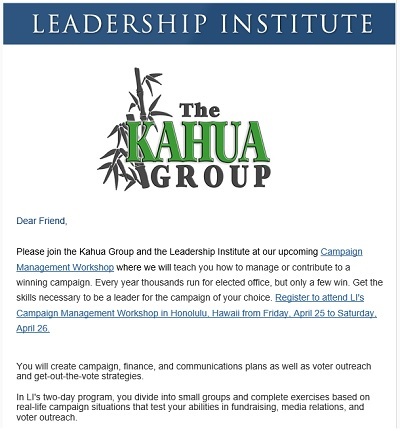 Deeply involved in Hawaii GOP-supported candidate training coordinated by Democrat consultant Dylan Nonaka's pro-Democrat "Kahua Group" , Kaumeheiwa-Rego was among several Democrats who were hired to teach several campaign classes to trusting Republican candidates who all lost their races. Never mind that Kaumeheiwa-Rego was an officer of the Democrat Party. We could go on all day about how Democrat infiltrators keep our party down. 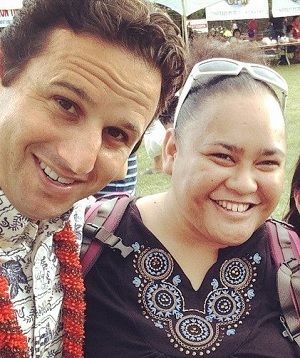 But let's talk instead about what REALLY matters to Ms. Kaumeheiwa-Rego: her progressive Democrat politics . 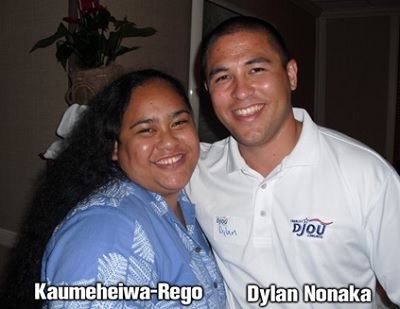 Also, in early 2014, Kaumeheiwa-Rego became Director of Fundraising for the Oahu branch of Young Democrats of Hawaii. 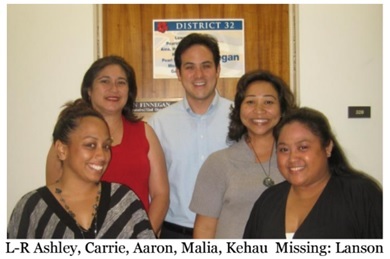 Click on their website and you'll see that she and her close pal Tania Kehau Cortez-Camero are both standing on the right side of the group photo with these activist Democrats; taken just before or just after the Republican Party's candidate training featuring Democrat consultants like Kaumeheiwa-Rego and Dylan Nonaka. No shame, yeah? Also, another bit of shocking news and questionable timing. 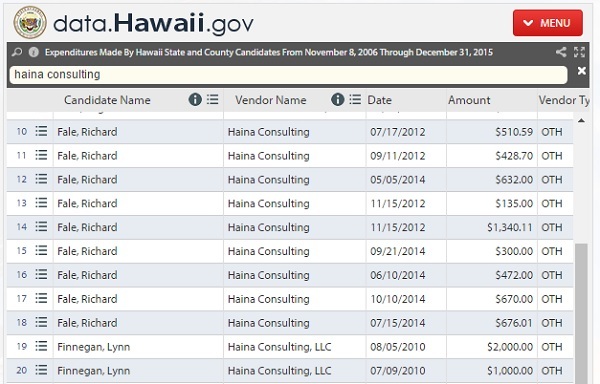 Failed RINO State Senate candidate Richard Fale, who appears to still be under investigation by Hawaii's attorney general for severe campaign finance wrongdoing 2014 , was paying consulting fees in late 2014 to Democrat Kaumeheiwa-Rego's company LONG AFTER she and her partner Ms. Cortez-Camero were publicly known to be officers of the Young Democrats (something which party officials long knew about privately). Yes, Fale hired officers of the Democrat Party to consult for his campaign. Maybe this was payback to Cortez-Camero for her big contribution to Fale's campaign two years earlier. Maybe not. 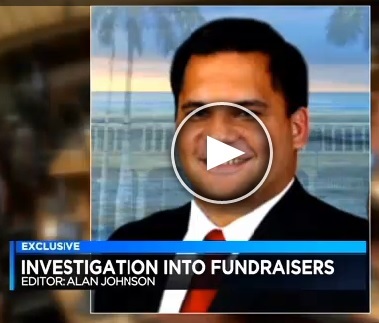 Either way, law enforcement authorities reportedly believe Fale's suspicious and murky campaign finances are related to illegal and unreported funds spent by Democrat consultant Dylan Nonaka's now defunct SuperPAC Hawaii Solutions and his now-defunct political consulting group Kahua Group -- all spent in regard to Fale's troubled campaign. More about that in a forthcoming HIRA newsletter. 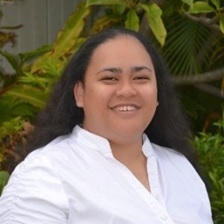 Now let's turn the page and get to know Tania Kehau Cortez-Camero. 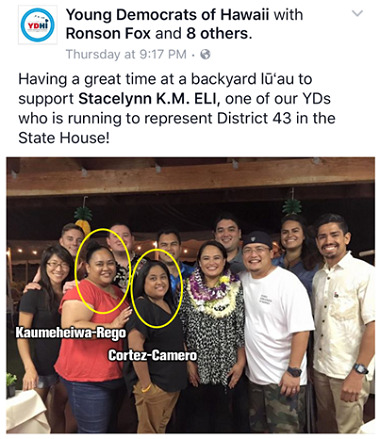 Just like her gal pal Ms. Kaumeheiwa-Rego, Ms. Cortez-Camero has been simultaneously working for Democrats and Republicans right under the noses of party "leaders" who haven't minded her infiltration of the Hawaii GOP at all. 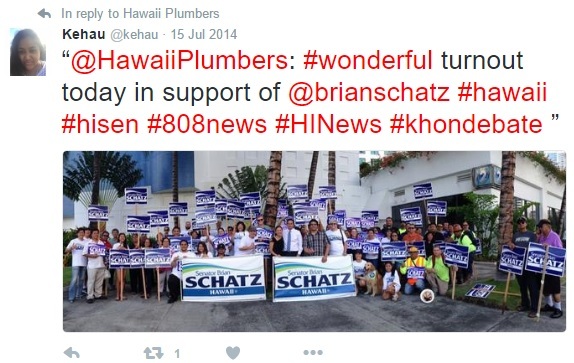 Right this minute, Charles Djou's and Dylan Nonaka's Young Democrat buddies are putting their time and effort into unseating Andria Tupola by supporting Stacelynn Eli , working alongside Eli's other heavy backers -- PRP (Carpenters Union), UPW , the AFL-CIO , Plumbers and Fitters , Operating Engineers , Hawaii Laborers & Employers , Ironworkers , Painters Union , and the HSTA -- so that Tupola can go back to whatever she was doing before (music teacher?). 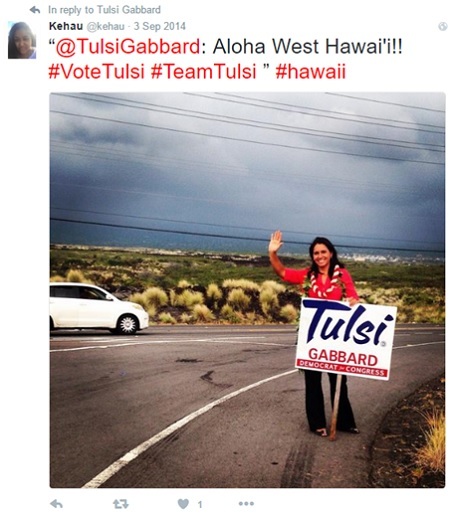 You gotta wonder how Tupola feels about these phony "Our Party, Our Ohana" Republican infiltrators putting Tupola in their crosshairs. Ironically, Republican-turned-Democrat turncoat Karen Awana is also running in the 2016 Democrat Primary next month in hopes of beating Stacelynn Eli in order to unseat nemesis Andria Tupola -- the one who unseated Awana back in 2014. It sure seems like 'bad karma' how RINO's and closet Democrats and Turncoats find their way into competition with each other. Anyway, playing both sides at the same time is not a problem, since Cortez-Camero's Republican employers (the same RINO's who also hire her pal Kaumeheiwa-Rego) knew full well that she was really a Democrat. Over the past few years, Cortez-Camero has worked as a legislative aide at the State Capitol for a slew of RINO's like former GOP state representative George Fontaine and Lynn Finnegan, and alongside "Our Party, Our Ohana" leader Malia Gray and Richard Fale's mother-in-law Carrie Kealoha. Working for "Republicans" at the State Capitol, Cortez-Camero got to work alongside other pretenders and party-switchers (including Aaron "Ling" Johanson) who are adept at fooling Republicans while fitting in nicely with other phony Republicans. 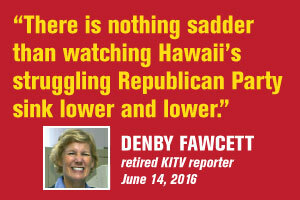 Yes, these are the types of duplicitous people running the Hawaii GOP into the ground. 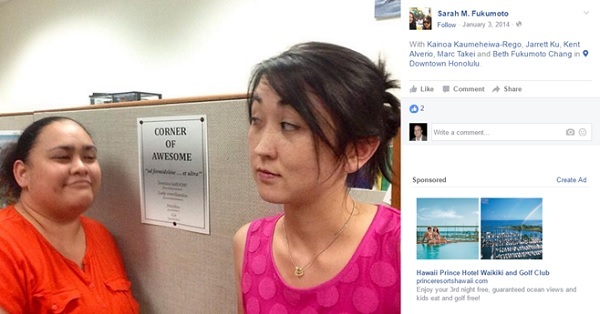 HIRA must respectfully disagree with the Facebook comment of RINO Beth Fukumoto's sister and state employee, Sarah Fukumoto -- one of Cortez-Camero's RINO co-workers at the State Capitol hired by closet Democrat Fukumoto: NO, Sarah, this is NOT one of the best things ever. It's NOT okay that Democrats and RINO's are destroying the Hawaii GOP while Charles Djou and Miriam Hellreich and Dylan Nonaka chuckle to themselves about the irony. 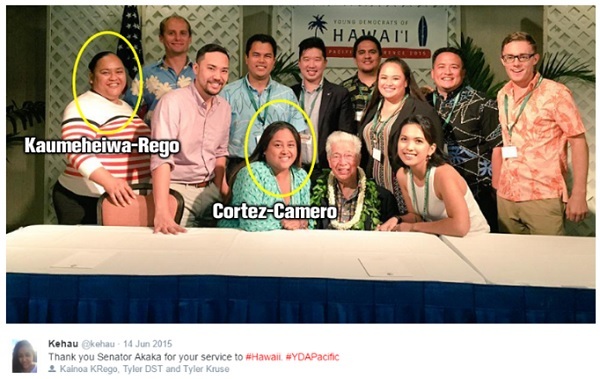 TWO FACED : Simultaneously an officer of the Young Democrats in 2014 through today, Cortez-Camero held the position of GOP House District Chair of HD2 as a member of the Hawaii GOP's 2013-2015 State Committee. Working right alongside RINO's Pat Saiki, David Chang, Boyd Ready, Miriam Hellreich, Beth Fukumoto, Andy Mukk. Fritz Rohlfing and other RINO's during 2013 through 2015 (and reportedly before that going back to as early as 2006). 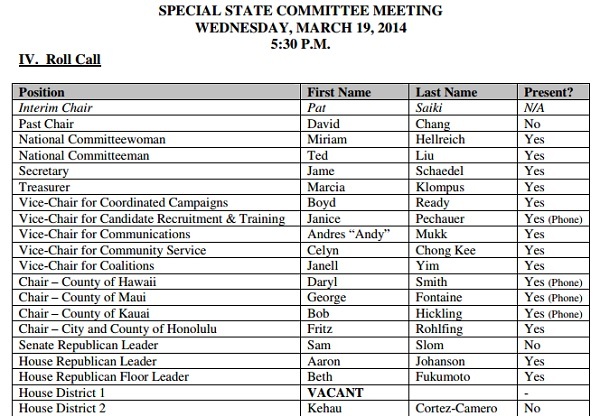 During this same time period, our infiltrator was a member of the potentially influential yet RINO-controlled GOP platform committee, which continues to help Hawaii Democrats by remaining neutral and silent on the many issues involving Democrat policy failures. That's why you can and should be suspicious of the neutral garbage the platform committee serves up when it has a history of Democrats like Ms. Cortez-Camero infiltrating the committee. H ere's where it gets more interesting. While on the party's state committee, the platform committee and running the Hilo-based district committee for the GOP, Cortez-Camero was actually serving as the deputy campaign manager for Democrat State Senator Willie Espero's campaign for U.S. Congress . Her start date? August 2013. So this Republican party leader is publicly spending her time getting a liberal Democrat elected with the full knowledge of her fellow party members. 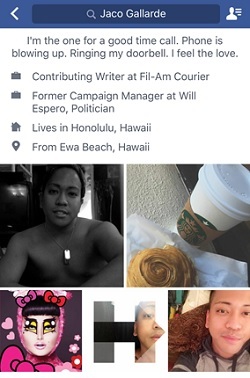 That's right, Cortez-Camero was state senator and congressional candidate 'Slick Willie' Espero's deputy campaign manager while supposedly 'helping' to run the Hawaii GOP. 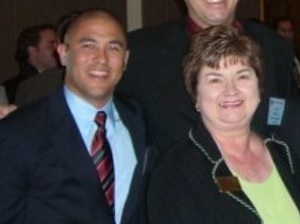 In case you're wondering who Espero selected to be his top campaign manager. Well, it was this, uh, very 'progressive' dude who supports Hillary Clinton, the LGBT agenda, and is looking for a "good time". Based on his Facebook profile alone, h e sure seems like someone who could easily find a job in Beth Fukumoto's Republican Minority Research Office. As if to rub it in our faces, while Cortez-Camero was officially holding various Republican leadership titles, she was eagerly and vocally helping Democrats like Tulsi Gabbard and Brian Schatz . Finally, while there is much more that HIRA could tell you about Ms. Cortez-Camero -- Delegate #37 to the Democrat State Convention, the Treasurer of the Young Democrats of Hawaii, the member of the Hawaii GOP's state committee, and the Djou campaign worker and state employee hired by so many left-leaning, collaborating and gullible Republican leaders. Cortez-Camero succeeded alongside her pal Kaumeheiwa-Rego in making the Hawaii GOP even more of a disaster thanks to their efforts. As officers of the Hawaii Democrat Party, they really did their job as Young Democrat infiltrators of the GOP by partnering with party liberals to ensure the continued decline of our Republican Party. As HIRA keeps reporting, these are just some the faces of many RINO traitors who have been openly working for Democrats right under the noses (and with the tacit approval) of Hawaii GOP leaders. This is WHY the Hawaii GOP is almost indistinguishable from the Democrat Party (as well as why we keep losing to them). These most recent revelations are just the tip of the iceberg in regard to how Democrats, liberals, and RINO's retain control the Hawaii Republican Party. Indeed, they have been playing conservatives and Republicans for fools while dancing with Democrats for decades. Traitors and infiltrators inside our party are openly working for Democrats right under the noses of party leaders like Charles Djou, Miriam Hellreich, Beth Fukumoto, Fritz Rohlfing and the rest. That's because Hellreich and other RINO's like Djou and former Republicans like Nonaka use these Democrats to assert control of Hawaii GOP. Don't think for a minute that GOP leaders don't know who their counterparts are in the leadership of Hawaii'sDemocrat Party. It's public information. Yes, the Democrat activities of Cortez-Camero and Kaumeheiwa-Rego has been known for years. The most important lesson to all real Republicans is to remember the RINO's who invited these liberal Democrats into our party headquarters and our campaigns and our minority caucus at the legislature. HIRA tells you their names over and over. And, based on their hiring practices, you can see that these progressives surround themselves with people who prefer the Democrat agenda to the Republican one. For example, with the kind of liberal Democrats that Charles Djou surrounds himself with, it's no longer far-fetched that Djou was the architect of HART or that he has five union endorsements from pro-rail unions in 2016 . . . including one union run by a member of the HART board (Damien Kim) happily running the rail project along with Colleen Hanabusa. And when you think about Beth Fukumoto's embrace of the high taxing, big spending agenda of the Democrats , it all makes perfect sense. Yes, these two Young Democrats have done a lot of damage throughout Hawaii's Republican establishment. 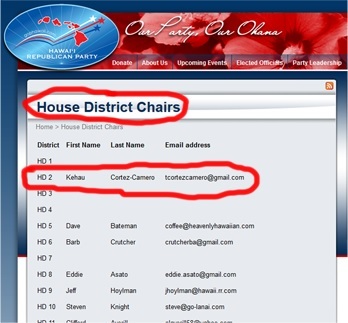 But since the party no longer posts the names of State Committee members ( the house district chairs ) on the party's official GOPHawaii.com website, it's not known if Rohlfing and other high-ranking party officers have allowed these infiltrators to remain on the party's secret State Committee. But as screenshots of internal party leader rosters shown earlier clearly illustrate, both Democrats were very recently still serving in leadership positions at our state party. Simply put, Democrats and progressives and RINO's feel welcome in our party because RINO's are running our party. RINO's control our party's executive committee, state committee, platform committee, rules committee, and the four county committees, by appointing their liberal buddies into these key positions. No actual work is expected from these friendly appointees in return for their loyalty when it comes time to vote to keep the party under the control of RINO's. Liberals in our party have kept the Hawaii GOP on the sidelines and out of the fight against Democrats. Liberals in our party were instrumental in pushing for the party's adoption of the party's issues-neutral LLIFE platform which tells Hawaii voters that we don't care enough about what's going on in the islands to actually take a stand one way or the other. Taxes - neutral. Rail - neutral. Giveaways to government employee unions - neutral. Abortion - neutral. Self-defense - neutral. Soft on crime - neutral. Fellow Republicans, that's how we got here; with liberals and Democrats infiltrating our ranks. And MANY are still in leadership positions in our party, in campaigns like Djou's, and behind the scenes on legislative staffs at City Council and the State Legislature. HIRA's Bottom Line: Hawaii's destructive RINO-fest needs to end so we can get our act together. The open invitation from GOP RINO's to progressives and Democrats needs to be rescinded. We need the right people and the right policies to turn our party and our state around. If the Hawaii GOP, Republican campaigns, and elected Republicans at State Legislature continue employing opportunistic RINO's and closet Democrats, the now 62-year-old reign of failed Democrat policies will continue much, much longer -- despite all the issues and statistics favoring the GOP being able to make our case to the public. For now, the lasting legacy of Ms. Kaumeheiwa-Rego and Ms. Cortez-Camero, two prominent members of "Our Party, Our Ohana", includes the following: (1) working for several years alongside Hellreich, Nonaka and other closet Democrats to push our party in a neutral direction; (2) bankrupting our party with overspending to purchase a luxury suite of offices; (3) and ensuring that the Hawaii GOP remains silent, liberal, disorganized, fractured, and hopeless. Hawaii is in deep trouble. With a Democrat Party and a RINO-controlled party BOTH working to protect the status quo, our only hope is to reclaim our hijacked Hawaii GOP. It's no longer a matter of wondering "if" our party has been infiltrated. We need to clean house and take back our party. Otherwise, Hawaii Conservatives and Republicans will continue losing to Democrats and RINO's at the State Capitol and City Hall on issue after issue . . . and losing every two years at the polls. Don't count on the crooked, infiltrated, Hawaii GOP's RINO establishment to clean up its own act. 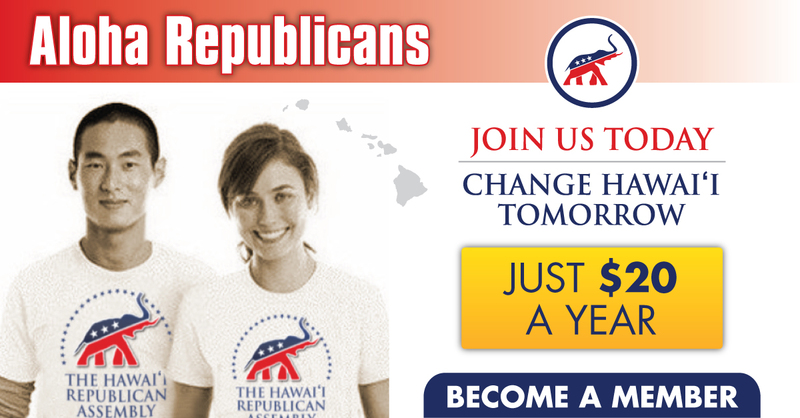 Join HIRA today and help change Hawaii tomorrow. comrades of Kainoa Kaumeheiwa-Rego and Tania Kehau Camero-Cortez are still active in the Hawaii GOP today, still 'helping' campaigns, and still working in Republican offices at the State Capitol and City Hall. Conservatives clearly have a lot of work to do if we want to take back our party from RINO's. Let's go!! Awww, isn't that nice? There they are again. Djou's and Nonaka's and Hellreich's buddies who run the Hawaii GOP into the ground are helping to make the Democrat Party more successful. And we wonder why we keep losing!! and the heart and soul of the conservative movement in Hawaii.